When you're hanging a slim but heavy electronic device worth hundreds of dollars, it pays to do the job right. Here's how. Even if you have minimal experience in home improvement matters, you are probably thinking, “Hey, come on, of course I can hang something on the wall.” But when that something is a heavy, glass-laden electronic device worth several hundred dollars, a seemingly simple task becomes slightly more complicated, if not downright challenging. But fret not: If you follow these steps carefully, you should have no problem mounting a flat-screen TV in your bedroom, den, or man cave. To choose appropriate mounting hardware, you must first determine the weight of your flat-screen (check the manual, or if you have the TV model number, look online). The manufacturer may sell a mount to be used specifically with your set. If it doesn’t, then purchase a “universal” mount rated for the weight of your TV. TVs lighter than 80 pounds may be hung from a single wall stud; larger units need two studs or more. So first, break out your stud finder and use it to locate the studs on the wall to which you’re going to mount your flat-screen. Don’t have a stud finder? Try this: Remove the cover from an electrical outlet, then use a pencil to feel around for studs. Because junction boxes are usually attached to a stud, you should encounter one. Measure 16 inches to the right or left to pinpoint additional studs. Place the mounting bracket onto the wall at the desired height, relying on a level to help you achieve the proper alignment. Now, with a pencil, mark the places where the screws or bolts are going to go. Set aside the bracket while you predrill holes in each spot where you made a pencil mark. The drill bit used should be slightly narrower than the screws or bolts included with your mounting kit. Note that drywall anchors are not to be used in mounting a flat-screen TV. If you wish to mount the TV on drywall, but no stud exists in the ideal position for the screen, then I think toggle bolts are your best bet. Proceed to attach the bracket to the wall with the hardware that came with your kit. (If your chosen mount involves lag screws, you’ll need a socket wrench.) Next, carefully place your TV face down on a soft surface so that you can attach the half of the bracket that fastens to the flat-screen. It’s one thing to be successful in mounting a flat-screen TV, but it’s another thing entirely to conceal the cords. 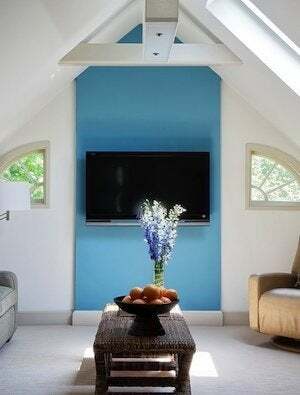 The easiest method is to run a wire molding down from the television. The cords hide in a neat column behind the molding, and if you paint the molding the same color as the wall, it’s not very noticeable at all. A cleaner option is to thread the cords behind the wall, but technically it’s illegal to do so. Fortunately, there’s a compromise—it’s an in-wall power extension (IWPE) or a power bridge kit. 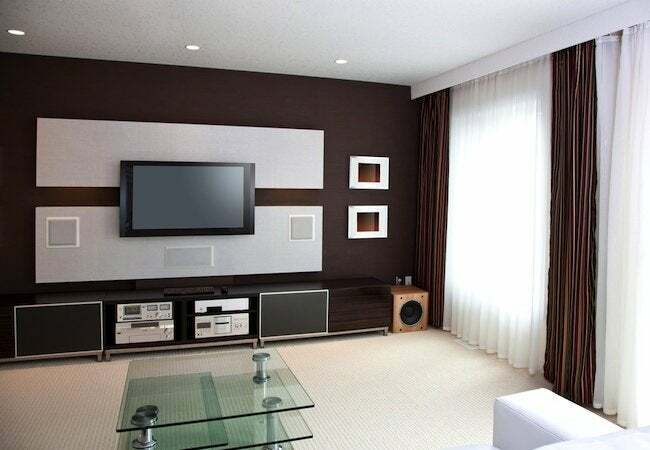 These enable the homeowner to install an outlet in the wall, more or less behind the TV screen, so it’s all but invisible to occupants in the room. Behind the wall, a power bridge cable travels from the newly installed outlet to another new receptacle installed lower down on the wall. Then you just run a power cord from an existing outlet or surge protector to the inconspicuously placed bottom receptacle. Now your cords are concealed—legally. Congratulations on making it this far. Now comes the easy part, actually hanging the TV. The bracket you’ve attached to the TV itself simply slides over the bracket secured to the wall. That’s all there is to it. Connect your cables, then sit back and relax with your favorite show. After all that hard work, you deserve a little time on the couch!